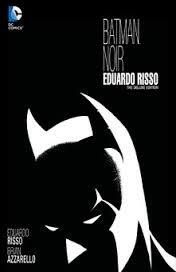 BATMAN NOIR: EDUARDO RISSO: THE DELUXE EDITION is a fantastic collection of stories featuring the Argentinian’s phenomenal artwork with his long-time collaborator, writer Brian Azzarello. The stories have been stripped of their original colour and are presented in stunning, stylistic black and white. These are dark tales starring the Caped Crusader and several of his nemeses, including the Joker, Killer Croc and the Penguin – as well as few new creations. Azzarello and Risso present Gotham City at its darkest; and it’s never looked better. There are four stories in this collection. The flagship storyline is BROKEN CITY, in which Batman investigates the murder of Elizabeth Lupo, a wannabe gangster looking to make his mark in a city brimming with freaks in make-up and dressed in spandex. Azzarello’s dialogue is pitch-perfect noir; Batman’s thoughts are reminiscent of a private eye’s voiceover in a film, and the plot is as intricate as any stellar prose crime story. It stands as one of my favourite Batman stories of all time – and I’ve been reading Batman comics for over fifteen years. The other significant tale is FLASHPOINT: BATMAN – KNIGHT OF VENGEANCE, which takes place in an alternate reality where it wasn’t Bruce Wayne’s parents who died on that fateful night in crime alley all those years ago; rather, it was Bruce. As a consequence, and thereby demonstrating the analogousness of the universe, Thomas Wayne takes on the mantle of The Batman, and we witness how that one alteration to the universe creates a horrible chain of events that are evocative of Bruce’s world. It’s a twisted tale, and the villain’s reveal left me with my mouth agape – truly. The other two stories are much shorter, and therefore not quite as resonant, but still serviceable anecdotes of The Dark Knight’s war on crime; bite-size chunks of raw entertainment. BATMAN NOIR: EDUARDO RISSO: THE DELUXE EDITION is the perfect collection for a reader of crime novels looking to delve into the world of comic books. No prior knowledge is essential; just jump in and be awed by Risso’s stylistic artwork and Azzarrello’s top-notch narration. This collection is evidence of two frequent collaborators operating at the top of their game.